For as long as humans have walked the Earth, people have searched for new ways to prolong their lives. Doctors today will tell you it's a combination of an active lifestyle and good genes that holds the true key to longevity. But what if the secret to long and healthy life is actually to throw back a tall glass of Guinness every day? Well, that's what a 100-year-old woman in the United Kingdom attributes to her still being alive and kicking and, frankly, we're not here to disagree. Newly minted centenarian Doris Olive Netting of Plymouth, England celebrated her big 1-0-0 last week with a party and a pint of Guinness -- the beverage she's been drinking every damn day since the 1940s. She hasn't downed a glass regularly just because she loves the taste of it, either. She truly buys into its health benefits. Specifically, she believes it's good for her because of the iron content of the iconic Irish stout, something the brand heavily touted in its post-war ad campaigns. "After the war there was a big marketing campaign to buy Guinness -- drink Guinness to get your iron -- following on from the ration years. So Olive did just that: a glass of Guinness a day for the rest of her life," Netting's granddaughter told The Independent. "That is what she puts her good health and age down to." 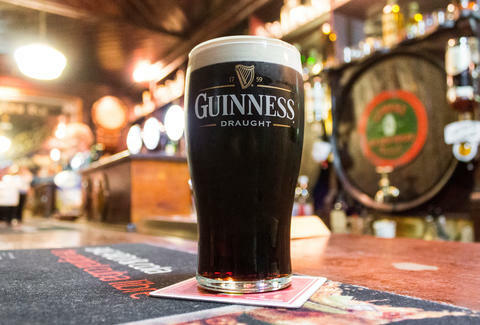 Truthfully, a pint of Guinness only contains about 0.3mg of iron, which is practically none when you consider the average daily iron intake for adult men and women is nearly 20mg. Still, you can't argue with results. The folks at Guinness caught wind of Netting's love for the their signature beverage and sent her a big personalized birthday gift basket complete with bottles of Guinness, a card, and Guinness-flavored chips. According to her family, Netting is in "remarkable" health and refuses to go a day without drinking her favorite tipple. So, next time you feel bad for skipping the gym for happy hour, don't, and just order a Guinness.